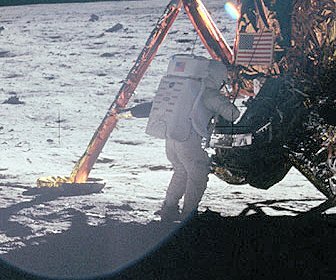 Al Reinert’s 1989 documentary “For All Mankind”, from Janus Films and the Criterion Collection, may contain the most definitive footage of the initial Apollo 11 moon landing and walk, with Aldrin’s famous “one step” quote. The film is simple, just in 4:3 aspect, but vividly shows the Moon as a black-and-white place, rather like the setting of a 50s sci-fi B movie. The early part of the film shows the men in propinquity on the spacecraft, finding unit cohesion in weightlessness. The first “walk” (on a hose) in orbit is scary enough still. A lot happens to your body when you’re hooked up to all this monitoring within the spacesuits. It’s interesting to ponder how far computers were advanced in 1969. The collective effort to produce this kind of engineering is stunning, and yet since 1969 (the moonwalk occurred just three weeks after Stonewall), society has gone in a different direction, resulting in global communications and the Internet today. The film has some interesting original music by Brian Elo, like “Sirens”. The film starts with President Kennedy's speech about "...because they are hard." The movie could be compared to a similar 2007 documentary produced by Ron Howard (dir. David Sington) “In the Shadow of the Moon“ from ThinkFilm. Of course, we remember the big films: “The Right Stuff”, and “Apollo 13” (1995) from Universal and Ron Howard (which I saw a second time on a flight back to Washington from San Francisco in late 1995). When I was substitute teaching, the eighth grade science class students had to watch the film, and one of the students wrote an interesting paragraph on how the Apollo 13 accident could have been prevented. It doesn't "deserve" a separate movie review, so here is a link to a Discovery Video about an ice-water volcano on Titan, possibly increasing the chance for finding life there some day, link.